General John Logon, the national commander of the Grand Army of the Republic declared the first Memorial Day (known as Decoration Day) on May 5, 1868, after the Civil War. He wanted people to honor the fallen soldiers by placing flowers on graves of Union and Confederate soldiers at Arlington National Cemetery. The northern states were the first to recognize this holiday while the South did not join in until after World War I. Memorial Day is a national holiday and a few of the southern states have an additional day just to recognize the Confederacy. Traditionally, Memorial Day was observed on May 30th. However, it was moved to the last Monday of May to make it a three-day weekend for federal holiday purposes, which could be one of the culprits of the holiday losing its true meaning. If you asked most Americans, "Why do we celebrate Memorial Day?" most of them probably wouldn't know. Unless you know someone who has died in a war, you probably don't think twice about what the day commemorates. It doesn't touch you emotionally enough for you to really care about the meaning behind Memorial Day except it being the beginning of summer season. In hopes to bring back the true meaning of the day, a National Moment of Remembrance was put into effect in 2000. The resolution asks Americans to have a moment of silence on Memorial Day at 3 p.m. local time. This moment of silence can be simply a time to reflect on history, meditate, or pray. Now that you know what the true meaning of Memorial Day is, you can make plans to do what it was originally intended. You don't have to do something extravagant, just something that reminds you of the people who fought for what you have today. This could simply be reading some history, saying a prayer for current soldiers, or taking a few minutes to educate others on the holiday's true meaning. A Memorial Day parade is a tradition in most cities and towns. It is also an opportunity for you to honor and show support for those who died while serving in the U.S. military. If by chance your city or town does not have an annual Memorial Day parade, you might want to contact your city council about setting one up. You can contact local businesses for sponsorship and invite school bands, cheerleaders, etc. You can then contact local newspapers to get the word out about the parade. Not only will this bring back what the day is all about, but it will also bring people out of their homes to celebrate something special. Keep in mind, you don't have to make it a solemn day, you can still attend or host a barbecue, go to the beach, have a picnic or take part in other Memorial Day festivities. These activities serve as a celebration for how far this nation has come, the soldiers who risked their lives for it, and the coming together of friends. 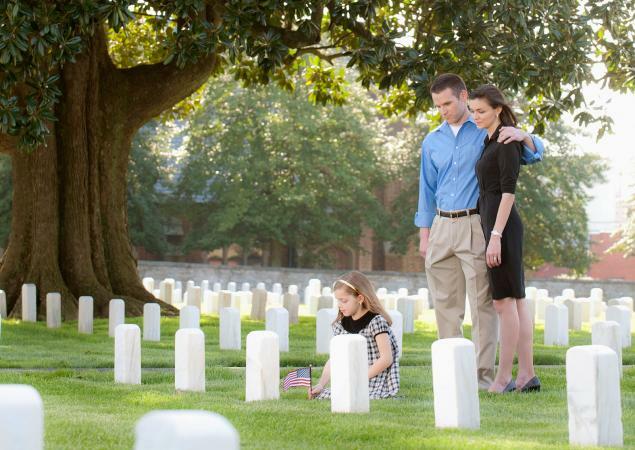 You may spend Memorial Day at a family gathering or visiting the cemetery or a memorial. It really doesn't matter how you spend the holiday as long as you remember the true meaning of Memorial Day and pay honor to the men and women who died while serving our country.